Dr. Schwarz is the director of the Echocardiography Laboratory. He performs routine imaging and advanced imaging studies on patients with complex cardiac disease. He specializes in imaging of patients with mechanical assist devices. He is board certified in Internal Medicine and Cardiovascular Disease. Dr. Schwarz studied medicine at the University of Rochester, where he completed medical school, residency and cardiology fellowship. During his training years, he developed an interest in studying ways of improving the quality and efficiency of treating cardiovascular disease. Dr. Schwarz then joined the faculty at the University of Rochester Medical Center, where he is now Professor of Medicine. Dr. Schwarz also holds a position as a Research Professor in Electrical and Biomedical Engineering at the Rochester Institute of Technology. 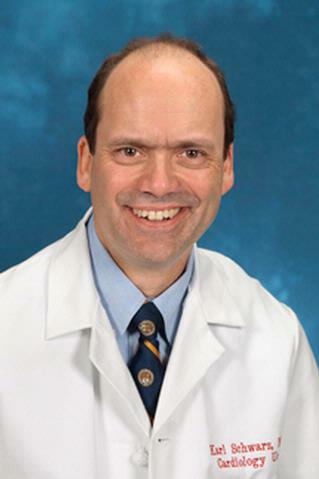 Dr. Schwarz is a Professor of Medicine at the University of Rochester Medical Center where he has been the director of the Echocardiography Laboratory since 1992. Dr. Schwarz received his undergraduate degree in 1979 at Bowdoin College in Physics. Dr. Schwarz studied medicine at the University of Rochester, where he completed medical school, residency and cardiology fellowship. During his training years, he developed an interest in studying ways of improving the quality and efficiency of treating cardiovascular disease. Dr. Schwarz then joined the faculty at the University of Rochester Medical Center, where he is now Professor of Medicine. Dr. Schwarz also holds a position as a Research Professor in Electrical and Biomedical Engineering at the Rochester Institute of Technology. At Bowdoin College, Dr. Schwarz completed his research thesis in superconducting magnetometry. During his college years at Bowdoin College, Dr. Schwarz was fortu-nate enough to work for a time at Argonne National Laboratory, where he completed a research thesis on the electromechanical properties of Nitinol; a then novel memory metal made from an alloy of nickel and titanium. Dr. Schwarz believes that the most effective way to improve medical care is through continuous medical education and continuous monitoring of medical outcomes. These two principles lead to the development of the Pronto cardiovascular system, a robust electronic medical record system that assists healthcare providers in the data collection process by pulling codified data directly from medical devices and then automatically creating robust text reports using a dynamic phrase generator. Dr. Schwarz is also known for his basic research into the behavior of small gas bubbles in a sound field. This work supports some of the principles that are now considered fundamental to the field of contrast echocardiography. More recently, Dr. Schwarz has been studying ways to better utilize and evaluate left ventricular assist devices (VADs), prosthetic heart valves, echo contrast agents, and cardiac transplantation. Some of this work is performed in conjunction with professors at the Rochester Institute of Technology, where Dr. Schwarz holds a position as a Research Professor in Electrical and Biomedical Engineering. His newest project is an on-line school for ultrasound education with the intended audience being sonographers. Conn NJ, Schwarz KQ, Borkholder DA. "Nontraditional Electrocardiogram and Algorithms for Inconspicuous In-Home Monitoring: Comparative Study." JMIR mHealth and uHealth.. 2018 May 28; 6(5):e120. Epub 2018 May 28. Ross Agner BF, Katz MG, Williams ZR, Dixen U, Jensen GB, Schwarz KQ. "Left Ventricular Systolic Function Assessed by Global Longitudinal Strain is Impaired in Atrial Fibrillation Compared to Sinus Rhythm." Journal of atrial fibrillation.. 2017 Dec 0; 10(4):1437. Epub 2017 Dec 31. Chaturvedi A, Thompson JP, Kaproth-Joslin K, Hobbs SK, Schwarz KQ, Krishnamoorthy VK, Chaturvedi A, Baran T. "Identification of Left Ventricle Failure on Pulmonary Artery CTA: Diagnostic Significance of Decreased Aortic &amp; Left Ventricle Enhancement." Emergency radiology.. 2017 Oct 0; 24(5):487-496. Epub 2017 Mar 29.